The Land Rover Discovery is one of the best off-roaders available, capable of climbing every mountain and fording every stream in the best Land Rover tradition. But a new Discovery is more likely to spend its life in school parking lots and Starbuck’s drive-throughs than out in the wilderness. 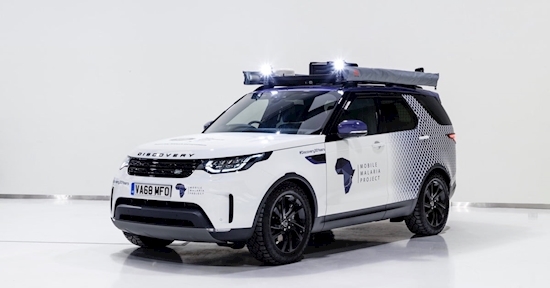 Bucking that trend, Land Rover will put the SUV’s capabilities to use for a good cause as a modified Discovery will head to Africa for an eight-week expedition to research malaria and attempt to improve efforts to contain the disease. The Mobile Malaria Project will use the Discovery to transport three Oxford University researchers on a 3,914-mile journey across Namibia, Zambia, Tanzania, and Kenya. The team will work with local research centers, using onboard equipment to study malaria parasite and mosquito populations, according to a Land Rover press release. they will also look at factors like drug and insecticide resistance. To do that, Land Rover equipped the Discovery with a mobile gene-sequencing laboratory, complete with a refrigerator and freezer for storing samples, and a dedicated battery pack to power everything. Other modifications include a dual sun awning that swings out from either side of the vehicle when parked, communications equipment, upgraded tires, LED night-driving lamps, and an expedition-style roof rack. The work was done by Land Rover’s Special Vehicle Operations (SVO) division, which normally does things like add a drink cooler to a Range Rover or some corner-carving capability to a Range Rover Sport. The Mobile Malaria Project won the 2018 Land Rover Bursary, a prize awarded annually in concert with the Royal Geographical Society. The bursary gives funding and use of a Land Rover vehicle to a group undertaking an expedition that requires such an off-road vehicle.